Boulder opal has a special place in my mind. Most of the times I've seen precious opal in jewelry, it is absolutely beautiful and obviously exceedingly special. Yet, boulder opal, which is a type of precious opal, has a striking ying/yang quality of extraordinary beauty in a matrix that is as ordinary-looking as dirt. When this piece was broken, it cleaved along a plane of opal leaving a lot of it exposed, but very difficult to use. The opal itself is exceedingly thin and the surface is uneven, so it can't be cabbed. Boulder opal is mostly cabbed by cutting across the thin lines of opal to emphasize the difference between the opal and the matrix. top edge. There wasn't enough on any side to do a proper cabochon, but there was a little bit. I made it into this free-form cab that looks like it is flowing through the matrix. I didn't grind it down to make a smooth surface the whole way; partly because I didn't want to waste any of the gorgeous opal and partly because it gave more of a look like it was active and moving. The natural irregularities of opal make it unsuitable for most commercial jewelry making. Much of the material you see, especially if it is reasonably priced, is likely to be laboratory-created. From the craftsperson's point of view, it is a beautiful, predictable product to work with.This pendant I received as a gift shows two varieties of fire opal and I love it and I'm pretty sure it was made with lab-created stone. You won't find this very cab-worthy stone nearby unless you are in Queensland, Australia although small amounts have been reportedly found in Brazil and Canada. It's a lot easier to get it the way I did--I purchased two chunks at the show in Tucson earlier this year. One of them is pictured at the top of this blog post. Back when dinosaurs were alive (the Cretaceous period - approximately 50-65 million years ago), silica from decomposing rocks mixed with water creating a gel. 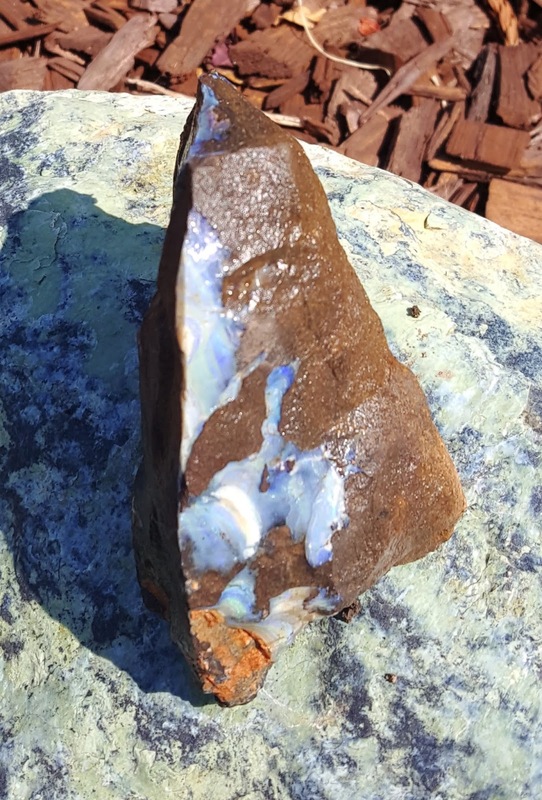 This settled into the cracks in the ironstone or sandstone boulders or puddled on the top and solidified over time become boulder opal. Notice I called this "precious" opal; there is also an opal material called "common". The difference is both how it formed and more importantly, how it looks. Precious opal is formed when the gel opal sets down in a series of rows. When seen in the light, it flashes iridescent colors that can include red, yellow, blue, green, often called "fire" because of the dramatic play of color, sometimes called "flash". The value of the stone depends on the drama in the flash. Common opal, on the hand, is well, common; but not without its charms. A friend once gave me a hunk of common opal. I took one look at it and decided it looked like halibut to me, so I tidied it up a bit and liked it so much I ended up making a meal display for the "Rock Hard Cafe" display I take to shows. 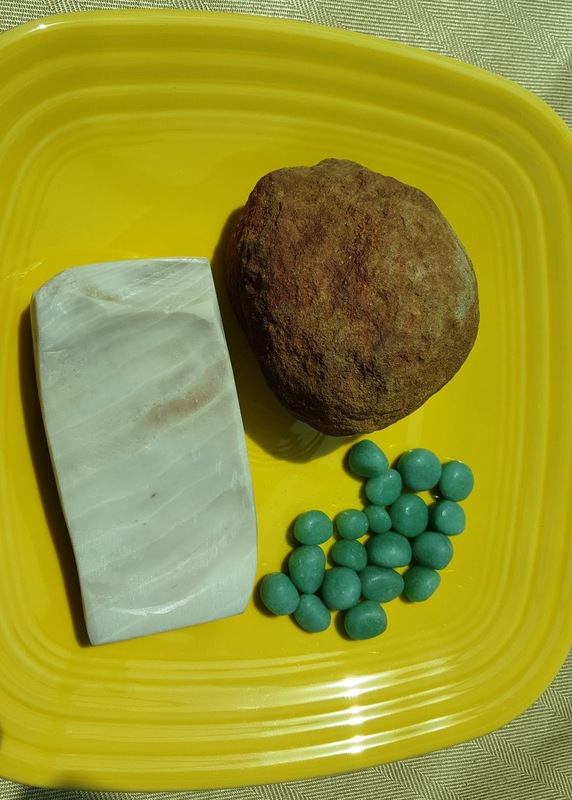 My halibut is shown here with a sandstone baking potato and some jade peas. You've probably learned that opal dries out and has to be stabilized in water, with oil, or chemical preservatives like Opticon. According to Opals Down Under boulder opals are very stable, can not absorb water, and are unlikely to crack. They are about the same harness as glass (about 6.5 on the Mohs scale). 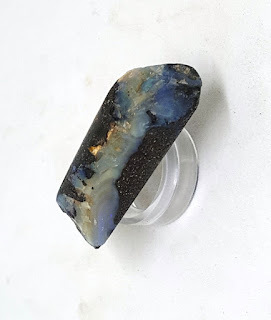 Soaking a boulder opal in water may hide small flaws (be sure to see it dry if you're thinking about purchasing it), and rubbing it with oil will only make your boulder opal oily, but neither will do anything to enhance your stone. In terms of preventing damage, Opals Down Under states, "The only major things that can damage your opal are impact, extreme fluctuations in heat (e.g. placing your opal over a flame) or exceedingly low humidity for long periods. Extreme variations in heat cause the opal to expand and contract, causing cracks or crazing." One thing that can definitely damage opals over time is having it touch other surfaces and acquire tiny scratches that affect the shine. If that happens, a professional jeweler can polish the stone and remove the scratches. 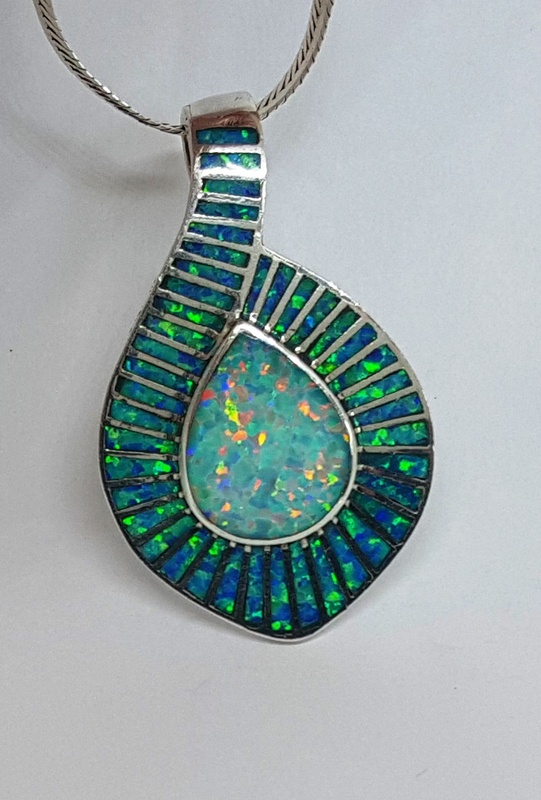 The possibility of scratching these beautiful stones is why many people choose to wear their opals as pendants or earrings to protect them from contact with other surfaces. It's also a good idea to store them in a jewelry box or bag. If you're thinking about working on some boulder opal, I say go for it! The material is soft enough that it won't take forever to cut, shape, and polish it, and you'll love the results! Have you worked with boulder opal? I'd love to see a picture of the cabs you made!